These true stories describe how TurtleSkin gloves have protected police and corrections officers from puncture, cut and needlestick. It is our hope that these encounters will help bring awareness to potentially dangerous situations. Police and corrections officers can come here to learn about the experiences of other officers in the field who stand by TurtleSkin police and corrections gloves. 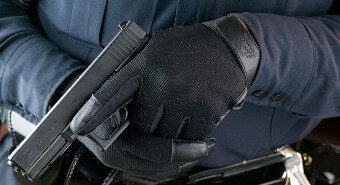 No police glove is cut or puncture proof, TurtleSkin gloves included. However, TurtleSkin gloves do provide the highest levels of cut and hypodermic needle resistance of any police glove on the market. The personal accounts and reviews detailed below focus on hand safety, particularly in regard to hypodermic needle. I specifically looked at your TurtleSkin stickproof gloves. At the time I thought they were a bit costly and decided to continue using the CSC (Correctional Services Canada) issue gloves. I thought maybe some time in the future I might buy myself a pair of the TurtleSkin gloves if I had a few extra dollars to play with. A few months later I was involved in searching cells in a living unit. I was searching a cell with another officer when I was poked with a tattoo needle the inmate had hidden behind a ledge. I can remember looking down at my hand with disbelief and thinking, "That didn't really happen." I pulled off my glove and sure enough, I could see a small needlestick mark on my finger. My partner told me to go to healthcare immediately and have them look at it. i reported the incident to my supervisor, who reiterated the need to immediately attend healthcare. I had to rush to the hospital for blood tests and to be placed on HIV protocol. I became sick from this medication and combined with not knowing what the future held, fear crept into my mind. The next week I was in a state of shock. My wife too felt the stress and fear from this incident. It was a very tough time that first week. Over and over I kept asking myself why I had not bought those gloves. The price seemed insignificant compared to the stress both me and my family were facing. I was lucky, the blood tests came back negative. The stress is now gone, but the fear of another needle stick is always in the forefront of my thoughts when conducting searches. I know that I do not want my family to feel the fear or stress that they felt while awaiting the results of those blood tests again. I know this will not happen because I will be wearing my TurtleSkin gloves the next time I conduct a search. The local newspaper, "The Brockton Enterprise" has a nice writeup on this incident. What happened was I had a suicidal man approach me outside the station. He started off by cutting a 12" lengthwise gash into his forearm with a razor. He then held the razor to his neck and said he would cut his jugular if I sprayed him with OC. I got some help on the way and we had about a 1/2 hour standoff with him. He informed us he also had Hepatitis C. He was very bloody as we tried to speak with him. He continued cutting himself with a razor on his chest and arms. As a side note: During our standoff, I grabbed the TurtleSkin gloves and placed them over my rubber gloves. I was lucky we did not have to come into direct contact with the blood or razor-wielding maniac, but I was better prepared for sure. I was the envy of the emergency personnel for sure. I was running radar early one morning, when I stopped a car doing 12 mph over the posted speed limit. After I ran a driver's license and warrants check of all four occupants in the vehicle, my dispatcher advised me that one was possibly wanted on a federal warrant. After securing him, I began to pat him down for weapons. As I felt the outside of his right pocket on his jacket, I noticed a bulge which I believed to be marijuana. When I pulled it out, it was a bag of dried minnows, which he stated that he eats. As I was completing the pat down, I was almost stuck by a hypodermic needle that the suspect claimed he was just using to hold his pants leg up. This is why I ordered a pair of TurtleSkin Police Gloves to protect me from any sticks. As promised, I will share with you the circumstances of an incident where I was stuck with a drug addict's needle. The incident occurred about four years ago in an upstate New York city. I was working patrol and about five of us were working some street-level drug interdiction. We were working on a particular drug house using one guy as a spotter and two two-man chase cars. The spotter had called out a suspected drug sale, gave the description of the buyer and vehicle, and the vehicle's direction of travel. My partner and I stopped the suspect vehicle a number of blocks from the drug house and asked the suspect to step from the back seat so that we could talk with him. My partner asked the suspect if he had any sharp objects on him and he adamantly denied having any. My partner handed the suspect over to me and I also asked him if he had anything sharp on him and told him that I was going to pat him down. Once again the guy denied any sharps on his person. I began patting his outer clothing and when I pat the front left chest area, I felt a sharp sting in my left ring finger. I looked down and saw blood coming from the tip of my finger and I handcuffed the suspect. I told my partner that I had been stuck. When we carefully pulled back the suspect's nylon windbreaker jacket, we saw that he had an open syringe in his shirt pocket. The needle from the syringe was pointing up and had pushed through the jacket into my finger. The suspect stated that he was HIV negative but later told us that he had Hepatitis type C and that he had a long history of IV drug abuse. We took the suspect to the hospital and both he and I had blood drawn for testing. My results were negative but his confirmed that he was infected with Hepatitis C virus. It was one of my worst nightmares. I had to go to the doctor for one full year every three months to be tested. I had to research the transmission rate from needlesticks for Hepatitis. Needless to say, my wife and I had to discuss the possibility of transmission from me to her. I was told that this disease could go undetected for years, lying dormant, before it became active. The incident affected me, my family, and my coworkers. From that day on I never conducted a search of a suspected drug user without protective gloves.